A selection of useful tidbits of information and tricks for the marine aquarist submitted by Advanced Aquarist’s readership. Readers are encouraged to post them to our Hot Tips sticky in the Reefs.org General Reefkeeping Discussion forum or send their tips to terry@advancedaquarist.com for possible publication. Next month’s Hot Tip theme will be “Calcium Tips“. Always be sure to cover any pump intakes or overflows to prevent an anemone from getting sucked in. For pumps like powerheads, sponge works well but be sure and clean it regularly. For overflows, you can use filter floss, or the fine mesh PVC gutter grills which can be found at home improvement stores. This material comes in a roll, is black which is a little less noticeable than white filter floss. You can use fine smaller cable ties to secure the material to intake, but be sure to use the ties that have no metal parts. Feed them! Its amazing how many times I hear “They don’t really need to eat.” They do need to eat. Feed them! I think that is the most important thing for keeping anemones successfully. Yes, I agree. definitely feed them. People complaint about anemones dying or losing color. I feed my anemones every time I feed my fish and the three anemones I have are huge, well inflated, and “perky”. Also keep that water quality up. Careful not to direct too much flow directly on top of them.. my anemonies have never seemed to like very strong flow. Also, don’t put a clown in the same tank that is oversized for your anemone. I’ve anctually had a few larger clowns pester my smaller anemones to sickness. For long tentacle anemones (Macrodactyla doreensis) to get them to stay in one spot excavate a small depression on the substrate and if possible let the animal make contact with the glass. Then surround the depression with some small pieces of live rock at the periphery of their tentacles. They may still wander but I’ve used this technique and they generally stay put providing lighting and flow are to their liking. Have also done this with a Heteractis malu anemone. One more tip – never touch anything in the Actinodendron family – these anemones are sometimes sold as ‘tree anemones’. They pack a ridiculously potent sting which causes severe pain. 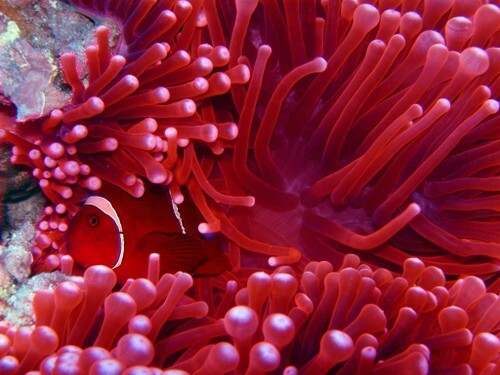 Anemones should NOT be kept in coral tanks. As a rule-they are more likely than not to wreak havoc with sessile animals. Anemones are also extremely sensitive to water parameters/quality – often more so than corals, and should not, as a general rule, be attempted by beginners in tanks less than a year old, as the chemistry ‘swings’ in non mature tanks can do them in. Always bear in mind the true final size of the anemone specie you’re thinking of buying – many get HUGE, fairly quickly, and are not suited for tanks under the multiple hundreds of gallons size (ritteris and carpets, specifically). Light symbiotic anemones the same way you would light a photosynthetic coral.